I’ve long been a fan of picture books for older students for many reasons. They are perfect for teaching a specific writing skill. They are short enough to share and use in a single class period. Many students, even older ones, have fond connections with picture books and enjoy new discoveries in the classroom (which they might otherwise not find in the library on their own in middle school). And there is just such a great wealth of fantastic books for older readers coming out each year, it is a huge gap in literature if you ignore the possibilities. I also have found that picture books, in particular, have the potential for becoming ideal mentor texts for digital writing projects with students. Certainly, authors and illustrators with picture books are not afraid to push against expectations and offer up creative ways to tell a story. Think about how many picture books (such as The True Story of the Three Little Pigs) break down that third wall and invite the reader into the narrative, or wreak havoc on our expectations of text — just like composing with digital tools can do. And the close partnership between image and text in picture books is something that most traditional novels can’t pull off, or at least, not in the same way. A number of years ago, I decided that I wanted my students to create science-based digital picture books. We had limited technology at our disposal, but we did have some computers with MS Powerpoint software loaded on them. It may have been designed for presentations for businesses, and it certainly has been overused, but I saw Powerpoint in a different light. The slides could be pages, and animation, audio and other digital elements might provide some compositional tools for constructing a picture book with digital elements. Who cares what Microsoft built it for? We would use the technology for our purposes. 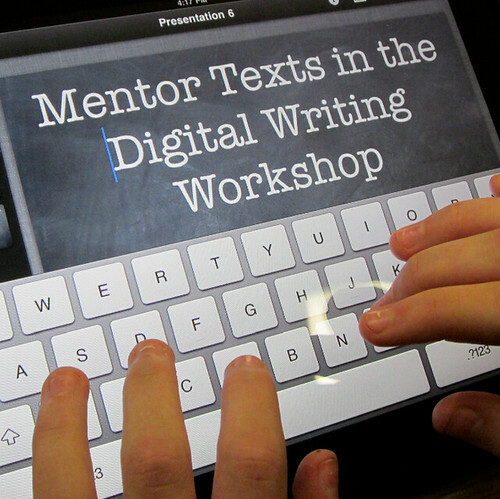 Now, back then, there were very few mentor texts out there for digital picture books. This is years before the iPad and other devices that have revolutionized the book publishing industry. This was the pre-App Age. But there was one series of picture books that I knew had some potential. The Magic School Bus series by Joanna Cole and Bruce Degen with its many layers of information and its many iterations made perfect sense. If you know anything about the series, consider the many layers of narrative and informational text and images that are folded into a typical Magic School Bus book. You have the characters chatting in speech bubbles; you often have notebook pages with scientific information and discoveries; and you have complex illustrations loaded with informational ideas. We’re not even considering the television show, the video games and other multimedia offshoots of the series, but those all demonstrate just how effectively the books were put together. Multimedia versions were no doubt relatively easy to pull off. We use the Magic School Bus series as a piece of literature (most of my sixth graders get a kick out of re-reading a series that they remember from childhood) and that leads them into creating their own science-based picture books, as a digital project. Some students even emulate the Magic School Bus concepts, using similar ideas as a launching pad for their own ideas. In this case, the books were to be about Cellular Mitosis, which they were studying in science class. My science teacher colleague and I were hoping that the picture book project would help with the difficult science vocabulary, and give them an opportunity to compose with digital tools. As I have mentioned in other posts in this series, I strongly urge teachers to create their own mentor texts, too, and bring those into the classroom as a means to reflect on the experience and allow students to question the compositional choices. So, I created my own science digital picture book just ahead of my students. It was a fictional story about a piece of yeast who infects a banana, and the topic was compost. The yeast flew around the screen, landing on different items, and I had some sound effects, and audio narration. * Some years, we were able to print out the books (copies of which are now in our school library) and students were disappointed by what they saw. They had created their book to be alive on the screen, not the page, and so the “flattened books” lacked much of what made them special to students. The Magic School Bus provided us with a means to envision a book of many different layers and possibilities, and as is often the case, the students took it from there. This entry was posted in Mentor Texts and tagged mentor texts. Bookmark the permalink. I heard you talk about this project at NCTE a few years ago. I was just starting to think about digital writing so I think I was listening for very big picture thinking. Revisiting your experience with this project after I’ve learned more about digital writing is powerful. So much new to think about now that I have some experience to fall back on. So many of us have learned from this project. Thanks!